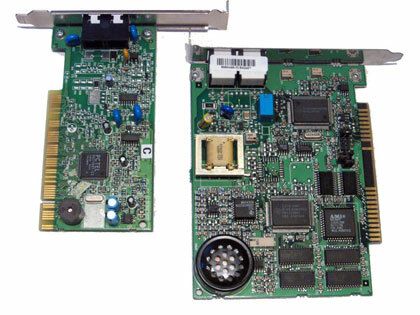 An interesting physical comparison between a traditional modem card and a more recent winmodem which uses the hardware in the host computer through software instead of dedicated components. Of course the earlier winmodems were; funnily enough; designed for the Microsoft Windows operating system, so its understandable why Linux drivers etc took so long to come to fruition. Mmm…. fruition. I can't say I miss the good ol' modem all that much anymore, thank you WiFi :D.